Plantation Brighton, on the Corentyne coast of Berbice, was owned by the Frasers of Belladrum. 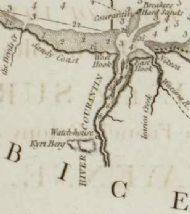 The Corentyne coast, between Devil's Creek and the Corentyne river, was settled after 1799, following an agreement beteeen the governors of Berbice and the neighbouring Dutch colony of Surinam. A spreadsheet detailing the slaves in 1819 and their family relationships can be downloaded from the library page of this site.